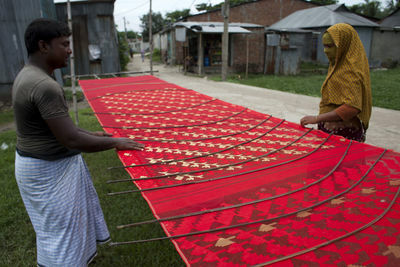 In December 2013, the Intellectual Property Association of Bangladesh (IPAB) celebrated a major success as Bangladesh's Jamdani Sari weaving tradition, a labor-intensive and time-consuming form of hand loom weaving is recognized as Intangible Cultural Heritage of Humanity by the United Nations Educational, Scientific and Cultural Organization. 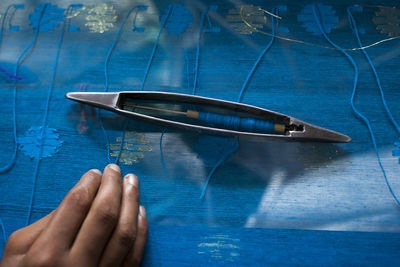 Jamdani is the finest Muslin textile produced in Bangladesh's Dhaka District. A sari is the traditional garment worn by women in the Indian subcontinent, made up of a long strip of unstitched cloth, ranging from five to nine yards in length, which can be draped in various styles. The most common style is for the sari to be wrapped around the waist with one end then draped over the shoulders with the other. 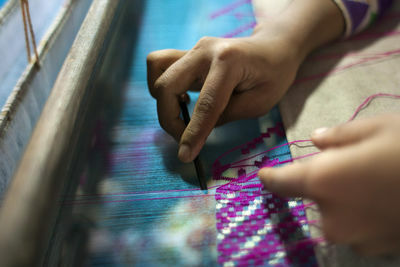 The Jamdani Sari is among the oldest styles, at more than 5,000 years old! 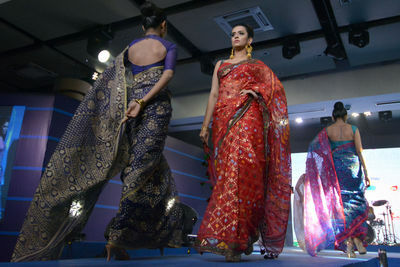 Some people think that the sari was influenced by Greek or Roman toga, which we see on ancient statues. However, there is no solid historical evidence to this effect. 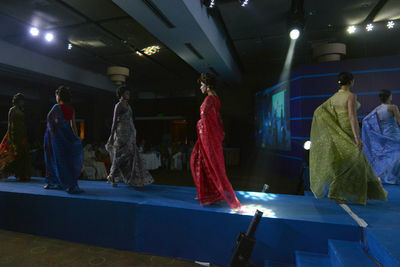 The sari is essentially designed to suit local conditions in the subcontinent. 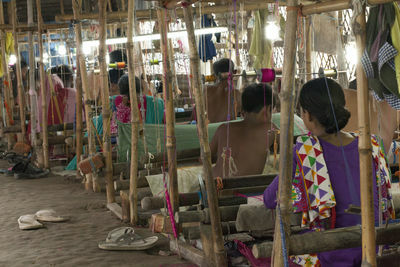 There are at least six varieties of Bengal handlooms, each deriving its name from the village in which it originated, and each with its own distinctive style. 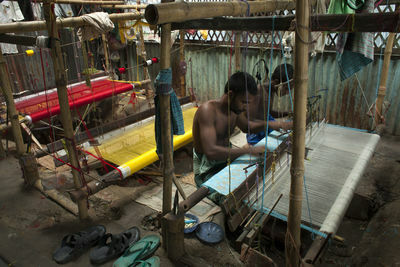 Dhaka was especially renowed for saris of fine muslin, a tradtion that carries on today. 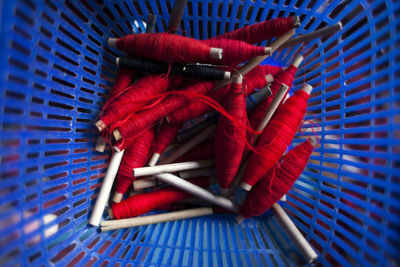 Jamdani is basically a transformation of the world famous Dhakai Muslin. 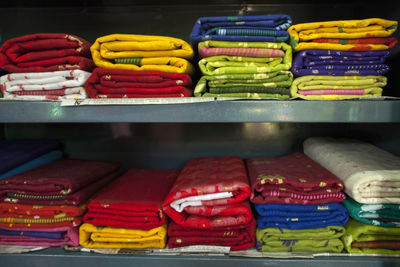 According to their variety, fineness and patterns the traditional Dhakai Muslins were divided into specific categories. 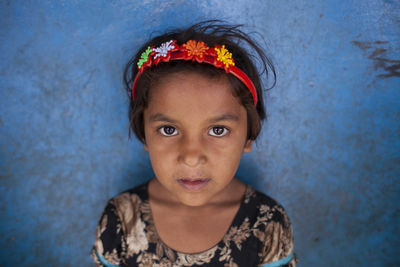 Among them, Aab-E-Rouhan, Shabnam, Sarband and Jamdani muslin were the most famous. Over the years the first three of these have vanished from history. The production, marketing and export of Jamdani has somehow maintained its continuity. 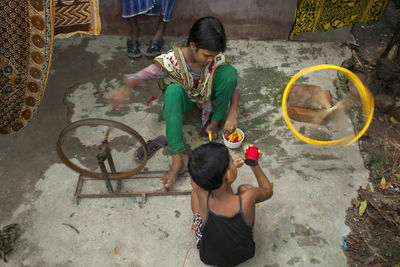 Dhaka has a history of only four hundred years from 1610 A.D., but the history of the cotton clothes of the region reveals more ancient traditions. Although most of the history of Jamdani weaving os lost in the mists of antiquity, it's known that trade in the fabric was established at least 2,000 years ago. 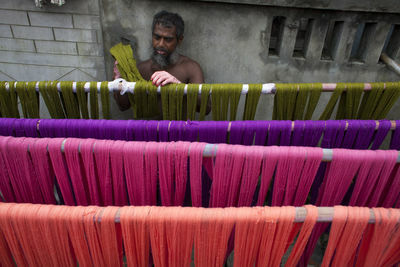 A Bangladeshi weaver designs a Jamdani Sari in the village of Rupganj Thana in the outskirts of Dhaka. 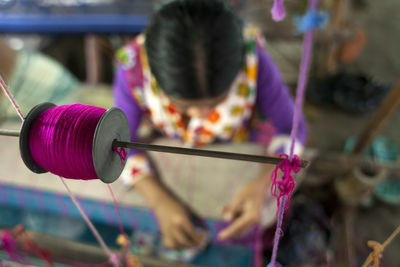 Jamdani is the finest Muslin textile produced in Bangladesh's Dhaka District. 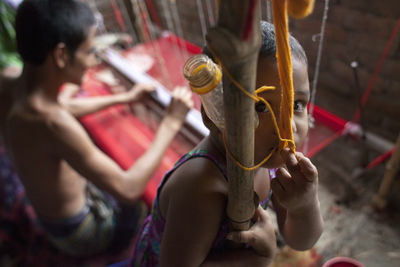 This time consuming and labor-intensive form of hand loom weaving has been declared intagible cultural world heritage by UNESCO. 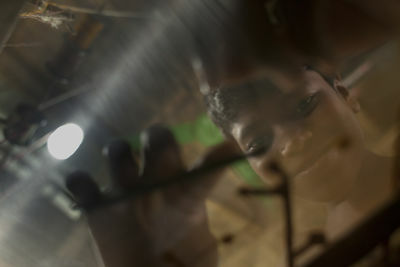 Portrait of a Bangladeshi weaver of Jamdani Saris in the village of Rupganj Thana in the outskirts of Dhaka. 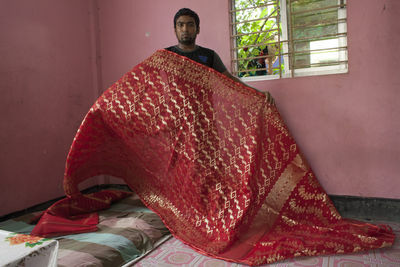 A whole saller of Jamdani Saris shows a piece from his collection in the village of Rupganj Thana in the outskirts of Dhaka. 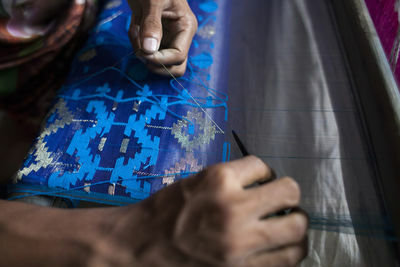 Jamdani Saris are made from the finest Muslin textile produced in Bangladesh's Dhaka District. This time consuming and labor-intensive form of hand loom weaving has been declared intagible cultural world heritage by UNESCO. 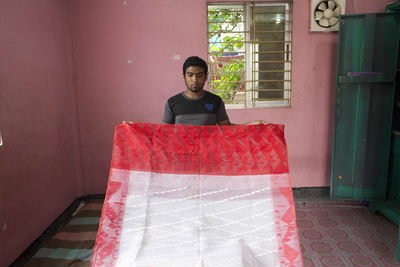 A model shows off a Bangladeshi traditional Jamdani Sari in Dhaka on 13 June 2015 when the Intellectual Property Association of Bangladesh (IPAB) celebrated the Jamdani Sari being recognized as an Intangible Cultural Heritage of Humanity by the United Nations Educational, Scientific and Cultural Organization. 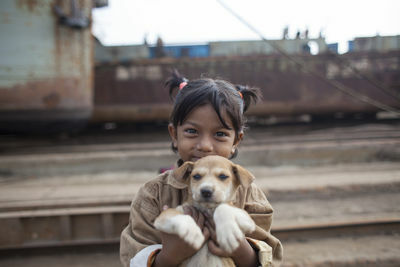 A child playing with child dog inside ship recycling yard near the Buriganga River in Dhaka.There are more than 35 shipyards in Old Dhakas Keraniganj area in the bank of the river Burigonga, where small ships, launches and steamers are built and repaired around the clock.About 15,000 people are working in extremely dangerous conditions earn Tk. 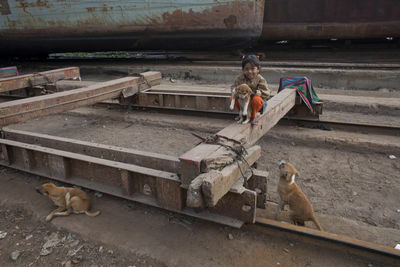 300-400 BDT (1 USD = 78 BDT) as they don't get safety gear from the dock owners and accidents are common.Most of the private shipyards use plate, engine, component and machinery of old merchant ship collected from many ship recycling industries located in Bangladesh. 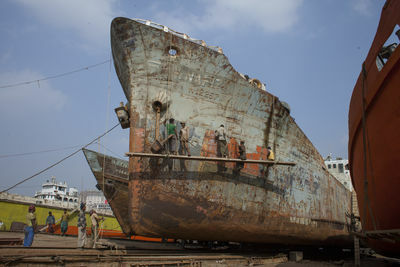 But frequent accident and heavy human causalities of inland vessels often raise question about the quality of ships produced in local shipyards.Bangladesh are now exporting small and medium-sized ships for the highly competitive European market. The vessels were built for countries including Denmark, Germany and Finland. Bangladesh shipbuilding is being compared with giants such as China, Japan and South Korea. School children near ship recycling yard in Dhaka.Shipyard workers near the Buriganga River in Dhaka.There are more than 35 shipyards in Old Dhakas Keraniganj area in the bank of the river Burigonga, where small ships, launches and steamers are built and repaired around the clock.About 15,000 people are working in extremely dangerous conditions earn Tk. 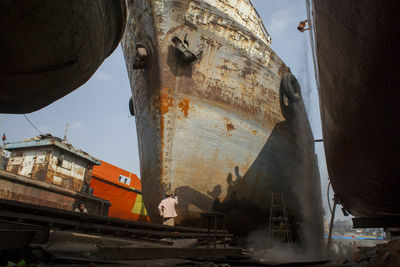 300-400 BDT (1 USD = 78 BDT) as they don't get safety gear from the dock owners and accidents are common.Most of the private shipyards use plate, engine, component and machinery of old merchant ship collected from many ship recycling industries located in Bangladesh. But frequent accident and heavy human causalities of inland vessels often raise question about the quality of ships produced in local shipyards.Bangladesh are now exporting small and medium-sized ships for the highly competitive European market. The vessels were built for countries including Denmark, Germany and Finland. Bangladesh shipbuilding is being compared with giants such as China, Japan and South Korea. 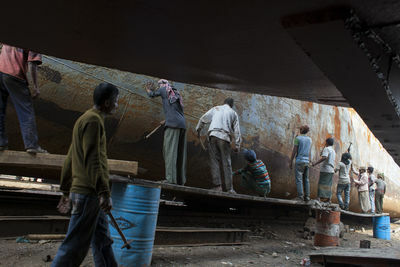 Shipyard workers near the Buriganga River in Dhaka.There are more than 35 shipyards in Old Dhakas Keraniganj area in the bank of the river Burigonga, where small ships, launches and steamers are built and repaired around the clock.About 15,000 people are working in extremely dangerous conditions earn Tk. 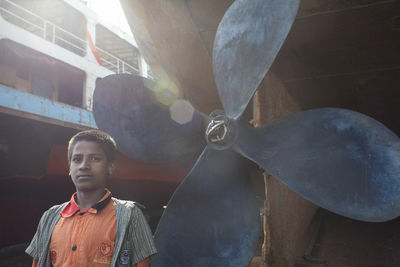 300-400 BDT (1 USD = 78 BDT) as they don't get safety gear from the dock owners and accidents are common.Most of the private shipyards use plate, engine, component and machinery of old merchant ship collected from many ship recycling industries located in Bangladesh. But frequent accident and heavy human causalities of inland vessels often raise question about the quality of ships produced in local shipyards.Bangladesh are now exporting small and medium-sized ships for the highly competitive European market. The vessels were built for countries including Denmark, Germany and Finland. 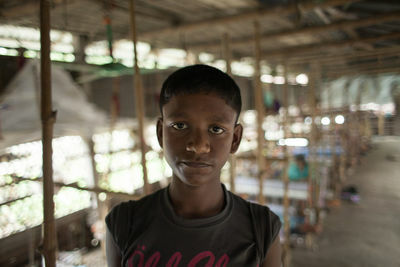 Bangladesh shipbuilding is being compared with giants such as China, Japan and South Korea. 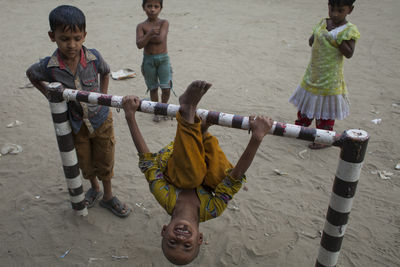 A primary school is situated near this yard, and children make their way to their classes using a dangerous path inside the shipyard, some of them using it as a playground, though a dangerous one. About 15,000 people are working in extremely dangerous conditions as they don't get safety gear from the dock owners and accidents are common. 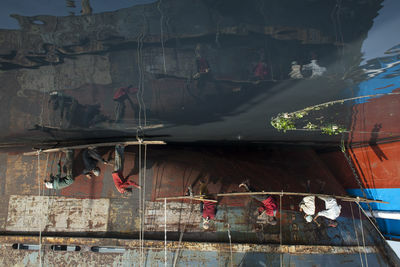 An old ship is maneuvered into place in a shipyard outside Dhaka where it will be either repaired or dismantled for parts and scrap metal. Frequent accidents and heavy human causalities on inland vessels often raise question about the quality of ships produced in local shipyards. Bangladesh are now exporting small and medium-sized ships for the highly competitive European market. 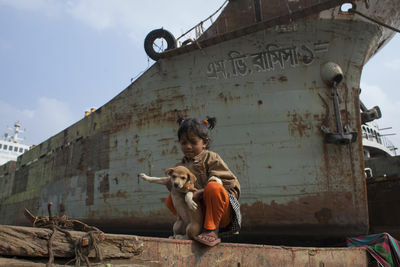 A child plays with her dog inside a ship recycling yard near the Buriganga River in Dhaka. 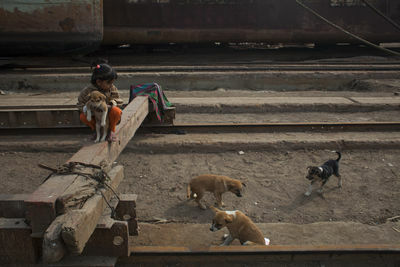 A primary school is situated near this yard, and children make their way to their classes using a dangerous path inside the shipyard, some of them using it as a playground, though a dangerous one. About 15,000 people work in extremely dangerous conditions and earn between $4 and $5 as they don't get safety gear from the dock owners and accidents are common. 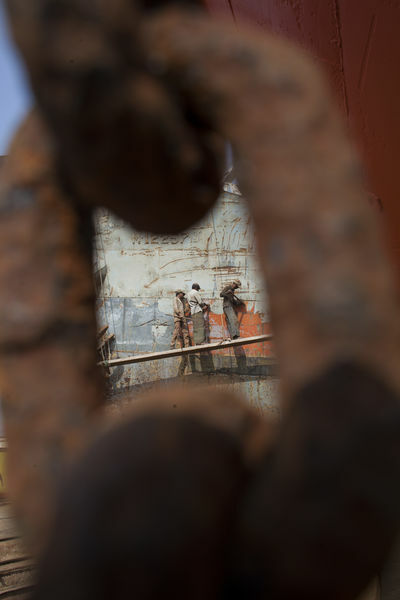 Shipyard workers say make very meager earnings, without proper safety, and surrounded by the smell of asbestos.